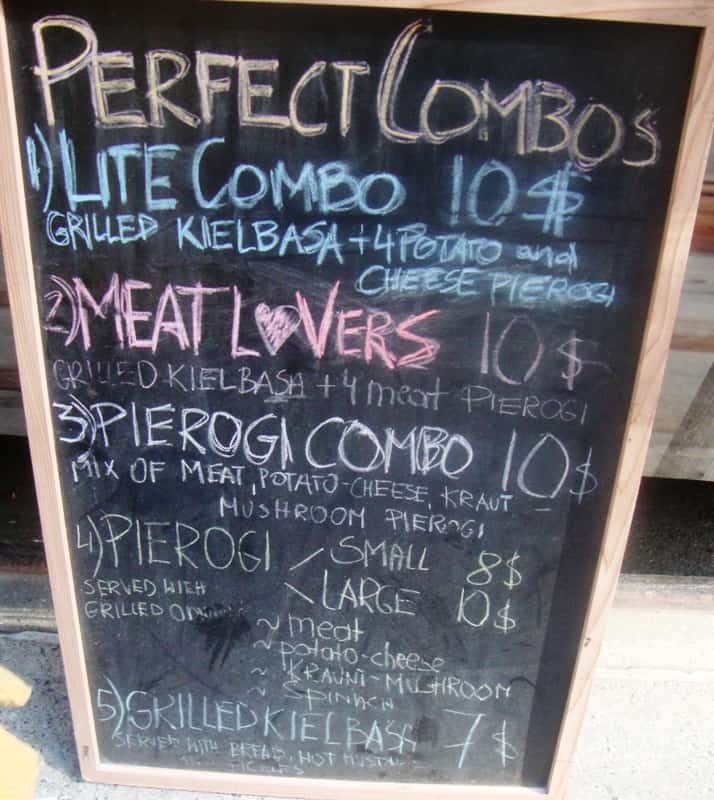 We haven’t been to the Old Traditional Polish Cuisine truck since April, and were looking forward to some new types of pierogies, and whatever else they had that was new. Yesterday morning the OTPC truck tweeted “We’re back on Broadway b/w 55th and 56th street with lip-smacking tasty PACZKI~ ready at 11:30”. Not only were they around the corner from our office, but they had Paczki, a filled donut-type dessert. 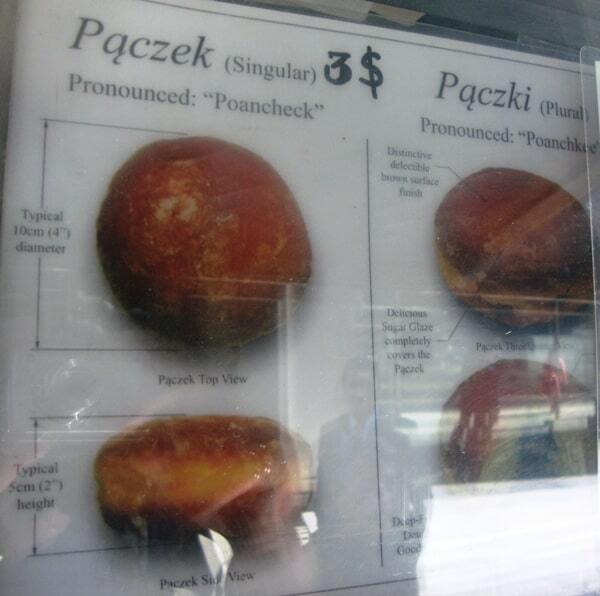 Next time we’re going to have to take lunch earlier, because they were sold out of paczki by the time we arrived, 12:45. As far as new pierogies, they had mushroom/sauerkraut and spinach on the menu, to go along with meat and potato/cheese, which we previously had. “Sorry, no spinach pierogies today” was the response, so we went for a combination of mushroom/sauerkraut and meat pierogies, plus a hunk of kielbasa for $10. Just in case 4 pierogies, an 8″ piece of grilled kielbasa and a pickle weren’t enough, they included 2 pieces of bread! This is perfect weather for heavy Polish cuisine, not something you want to eat too much of during the summer. The kiebasa was very nicely grilled, with crispy skin around strong, garlicky, peppery meat. A nice grainy mustard was the perfect accompaniment. A combination of mushroom and sauerkraut pierogies were good, with both flavors coming through. The brine of the sauerkraut was deepened somewhat by the ‘shrooms. We still like the meat pierogies, with peppery, shredded pork enveloped by the dough. Unlike last time, there were no grilled onions to go along with the pierogies. We would have like sour cream on the side too. Theses were two surprising omissions, in an otherwise enjoyable meal. The Old Traditional Polish Cuisine can be found on twitter here and on our Mobile Munchies twitter feed. Their facebook is here. In addition to paczki, they also have strawberry or blueberry pierogies, which we would like to try when they are available. We’ll make sure to get there earlier next time. For now, we were quite happy with grilled kielbasa and savory pierogies.